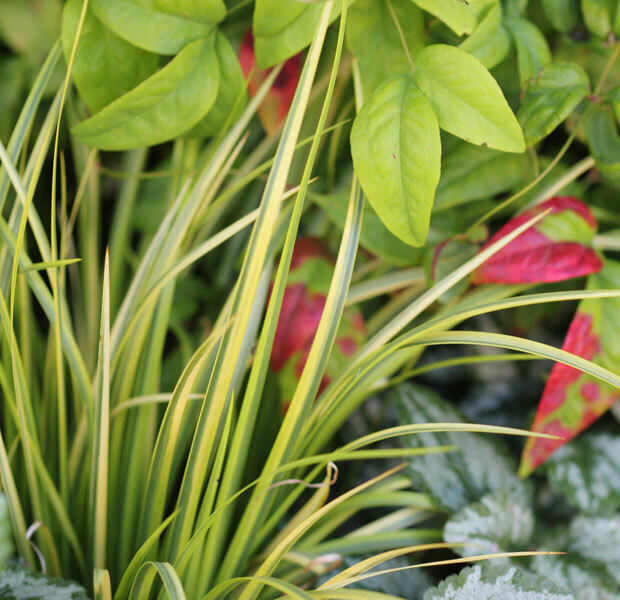 Home > Blog > Christine's garden > Foliage Follow-up – What happened? 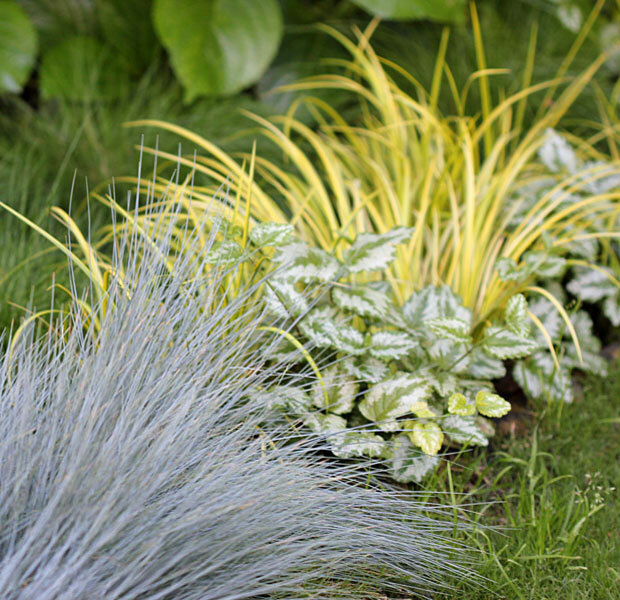 “Variegation is the appearance of differently coloured zones in the leaves, and sometimes the stems, of plants. This may be due to a number of causes. Some variegation is attractive and ornamental and gardeners tend to preserve these”. Most gardeners love variegated foliage and I’m no exception. 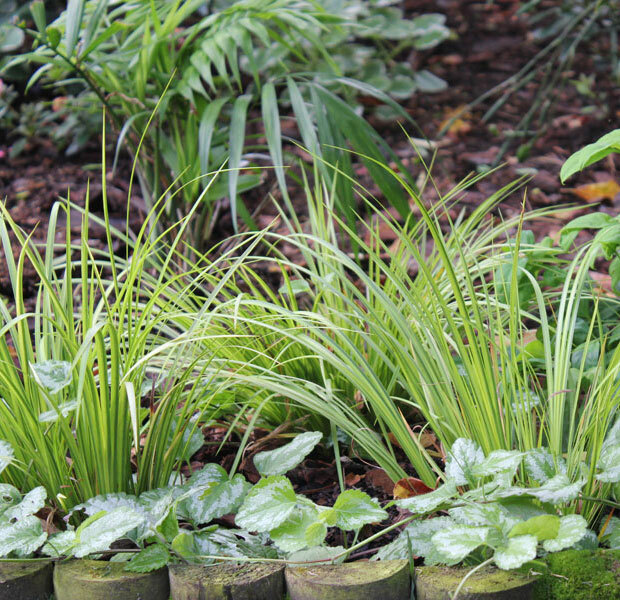 I love the contrast they provide and discovering how one can add interest in a garden with different colours, shapes and textures of foliage is what really got me interested in gardening. 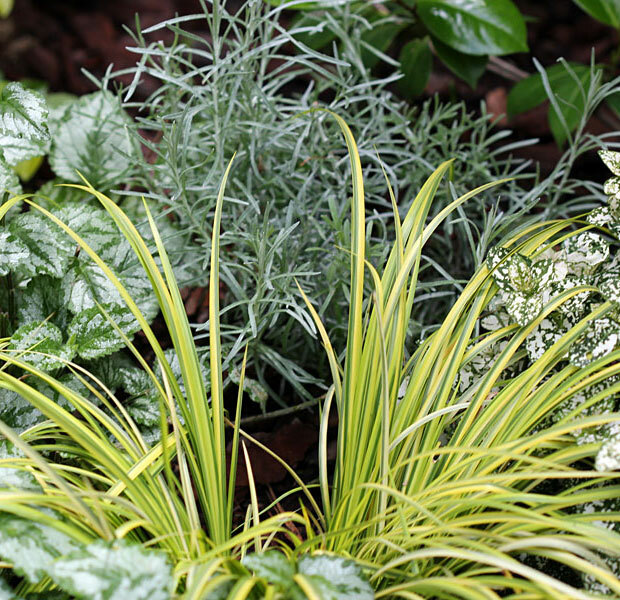 I can spend hours looking at different foliage types in a nursery and I have spent many, many hours pouring over books learning about different plants and their foliage and how to use them in a planting scheme. One of my favourites has been the unassuming Acorus gramineus ‘Variegatus’ (Japanese sweetflag) that I use as a contrast in my back shade garden. I’ve really loved this easy plant and have used it in my big plant bed as a border at intervals, for repetition and colour. Its been a stellar performer up until very recently when I noticed one of the groupings starting to go ‘all green’, i.e. reverting to all one colour (‘reverting to type’ is what I believe it is called). I thought I’d show a few photos of it … the way it was and how it looks now. And now … just a few months later its ‘returning to type’ / going green. Sigh … what to do? Is this something I should be expecting? Is this normal? It is not an expensive plant. In fact I can buy them very cheaply and am wondering whether I should just yank these out and replace them with fresh new plants, or will they change back again? 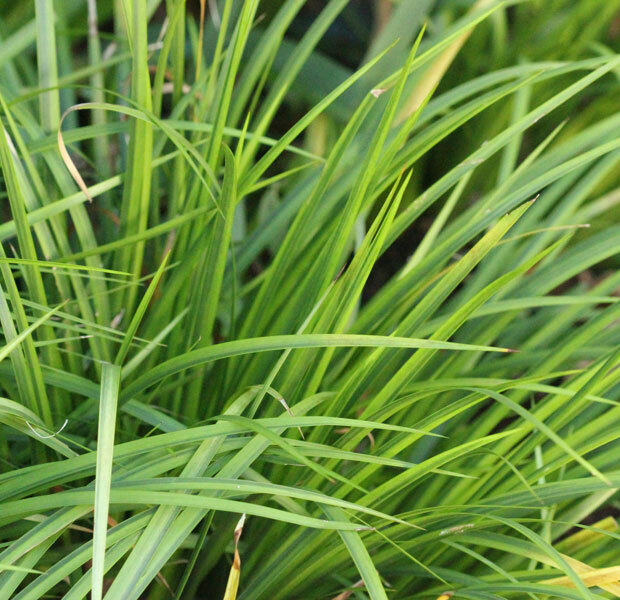 I love this plant – It’s evergreen, has narrow, shiny erect, fine leaves that are about 12 – 18 inches long. According to my notes it likes Sun to light shade; prefers moist to wet organically enriched soil. I’d really appreciate any opinions and advice on this. They don’t look attractive the way I’ve planted them if they are all just green like this as they just look like ordinary lawn that has been left to grow wild – which is not the look I was going for, or want right here. It looks exactly like overgrown lawn right now. I have no idea why it’s turning green, I just think it’s pretty. But I do agree that a light exposure experiment is the best way to determine the cause if you think that’s the reason for it losing its variegation. I love variegated foliage too! Some plants show greater variegation according to the season, but I agree that yours probably needs more light. I like Alan’s suggestion, too. Good luck! Heyyy, Christine, seems like you’re on your way to an interesting experiment, centering on light and maybe moisture and temperature. I’m looking forward to reading what you learn. Meanwhile, I much enjoyed your images showing the differences in variegation. They’re beautifully graphic. Here’s to the garden of learning. Hi Christine! Let me start off by saying, thank you for sharing such beautiful photos! I found them inspiring to use this plant that I have seen but had kinda forgot about! I have a new shade bed so there must be a spot for it! I agree with the ideas of Alan and Chrstina, it could very well be the low light. The other idea I had was are the temperatures getting quite a bit cooler for your area? That in combination with lower light could be why they are mostly green now. If possible maybe keep some of them planted where they are and see if the variegation returns next spring. Good luck! This is interesting – I have never seen this before! Hmmmm…….. I think Christina and Alan have some good advice here. I think Christina could be correct. I have all mine in at least part shade. I like Alan’s idea too…aren’t I a big help? No idea what caused that, but perhaps the idea about the amount of light is correct. It is a very pretty grass – I can certainly see why you like it. I love it in sunny yellow-green, but you’re right, as a green, grassy plant, the effect is not the same. I hope you can find a good substitute that will keep its variegation. Thanks for joining in for Foliage Follow-Up! Will have a closer look at mine tomorrow, perhaps it is the new leaves roaring out. And they’ll get their yellow stripes back later. I don’t know. What I’m wondering is … will they revert back to variegated if we let more light in or do they stay solid green once this happens? Dig some up, put into a pot, and move into sun. If it regains its variegation, then you’ll know. Some plants will revert to green forms with the new growth, but it sounds like yours came up variegated and then turned green? 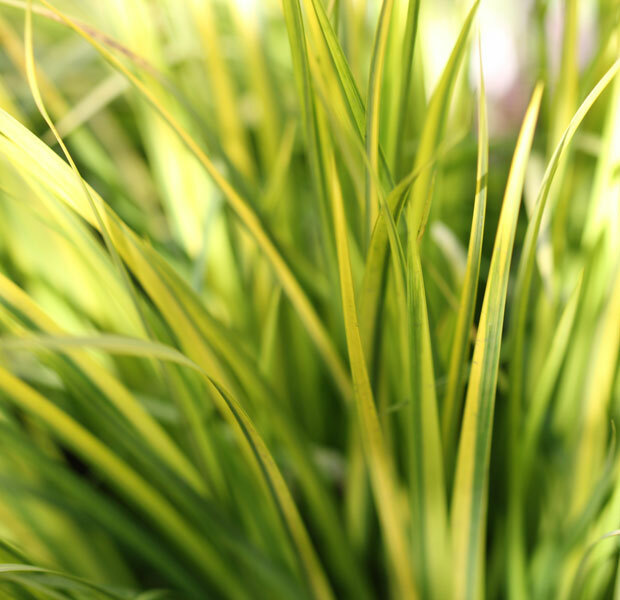 Also, some plants produce variegated leaves early in the season, then more green later. I’ve got some bamboos that do that — the spring foliage is so creamy, but by mid-summer there are lots of green leaves in there too. Very good idea, thanks Alan! Will pot some up and move it to a sunny position and see what happens.